From the trans-Alaska oil pipeline to bridges, buildings and roads, Laborers’ Local 341 has helped build Alaska. Chartered in 1947, with jurisdiction over Southcentral and Southwest Alas­ka, the union represents members of the construc­tion, health care, public sector and service contract industries. Local 341, together with Local 942 and Public Employees Local 71, compose the Alaska District Council of Laborers, which is affiliated with Laborers’ International Union of North America (LiUNA). LiUNA’s members are united through collective bargaining agreements that help them earn family-supporting pay, good benefits, and the opportunity for advancement and better lives. According to the 2018 Alaska’s Construction Spending Forecast, the need for skilled construc­tion workers in Alaska is increasing. The total value of construction spending “on the street” in Alaska in 2018 will be $6.6 billion, up 4 percent from 2017. The increase is largely due to a recovery in petro­leum-sector spending, which is expected to grow 15 percent. Mining, utilities and defense spending are also expected to increase. Along with negotiating on behalf of its members and advocacy work, Local 341 is committed to training the next generation of construction workers so they can meet the demands of Alaska’s third-largest industry. The Laborers’ apprenticeship program, admin­istered through the Alaska Laborers Training School, teaches the necessary skills to become a construction craft laborer by combining classroom instruction with on-the-job training under the supervision of journey-level workers. Each appren­tice is required to complete 144 hours of classroom training per year, with topics that include hoisting and rigging, pipelaying, scaffolding and OSHA 30. Originally from Monroe, Louisiana, apprentice­ship graduate Kyle Colvin said he’d always been drawn to the construction industry. “I didn’t have family members in the industry, but as a kid, I’d always liked building things. It sounds silly, but my favorite toys were always blocks and Lincoln Logs. I was about to graduate high school, and my uncle and family friends encouraged me to look into a construction union apprenticeship program,” he said. Enrollees of the Alaska Laborers Training School, regardless of experience, immediately begin to earn a wage while learning on the job and in the classroom. As their skills, knowledge and experi­ence increase, so does their paycheck. The school — usually a four- to five-year commitment —allows apprentices to achieve journey worker status. Colvin graduated in summer 2017. While most of his friends who attended college are wondering how they’re going to pay off their student loan debut, Colvin has no such concerns. the skilled members of Local 341. 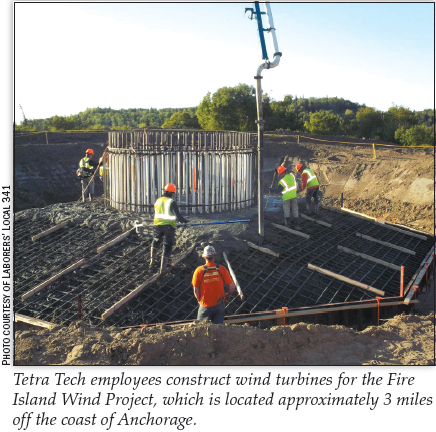 AGC of Alaska membership has been instrumental to Local 341’s success, Merrick said. Leonard Taylor, a supervisor with ASRC Civil Construction and an instructor at the Alaska Laborers Training School, says Local 341 is important to both contractors and its members. “Not only does the union help ensure a safe working environment and a living wage for its members, but contractors benefit from trained employees,” he said. Laborers have achieved impressive safety records. In over 11.5 million man hours from 2010 to the present, members had a days away, restricted or transferred rate (DART) of 0.03. In that same time period, there were only two DART incidents, again, in over 11.5 million man hours. This unbeat­able record alone — while members are conducting major projects on the mainline — demonstrates members’ exceptional dedication to safety. 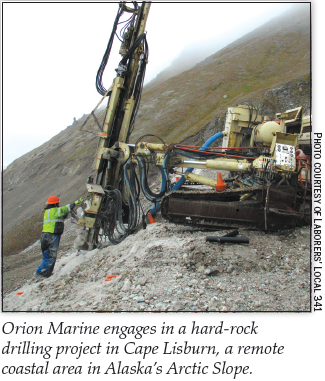 Building on Local 341’s unbeat­able safety record on Alaska’s most complex projects, Local 341 looks forward to continuing its strong part­nership with contractors and working on the many new projects on the horizon. For more information about Laborers’ Local 341, including its apprenticeship training program, visit www.local341.com. Carly Horton Stuart is a freelance writer based in Anchorage.